The Charismatic Egnima spoke to Click Orlando where he discussed the fear that he went through after his return from injury. His rotator cuff surgery in October 2017 stuck with him for a while as he continued to experience phantom signs that he may become re-injured. "It was scary at first, very intimidating," Hardy said. "Like, every night 'okay, this is the night.' All those little clicks and cracks in there, I'm gonna hurt it again. So far so good man, I've had more lower back issues and elbow issues than from the rotator cuff surgery." 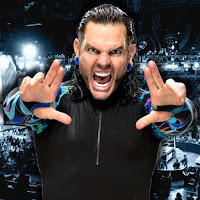 During the final months of The Hardys' time away from WWE, they went on an Expedition Of Gold collecting titles from a multitude of professional wrestling companies most notably Impact Wrestling and ROH. They had proven a rebirth in a Broken gimmick was successful and the two were primed for a return to Vince McMahon and Company. Jeff said he and Matt were ready for their WWE comeback as the two were having outstanding moments in the ring, but they longed for a bigger stage to perform on. "It all worked out because we came back because we wanted to finish where we started which is in the WWE. So it's exciting to still be 40-years-old and still painting my face and having good matches and feeling very healthy. I'm just very blessed and lucky to be here."